In the Northern Hemisphere, "peak" sunlight usually occurs on June 20, 21, or 22 of any given year. That’s the summer solstice. By contrast, the Southern Hemisphere reaches peak sunlight on December 21, 22, or 23 and the north hit peak darkness — that’s our winter solstice. No one really knows why Stonehenge was built some 5,000 years ago (at least I don’t, sorry). But one possibility is that it was used to mark solstices and equinoxes. 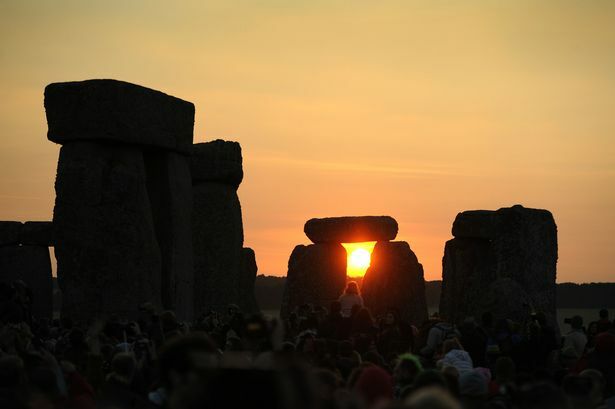 That’s because, during the summer solstice, the sun rises just over the structure’s Heel Stone and hits the Altar Stone dead center. Probably not, although it's close. And the reason why is quite interesting. Joseph Stromberg did a fantastic deep dive into this topic for Vox a few years back, but here’s the two-minute version. Ever since the Earth has had liquid oceans and the moon, its rotation has been gradually slowing over time due to tidal friction. That means — over very, very long periods of time — the days have been getting steadily longer. About 4.5 billion years ago, it took the Earth just six hours to complete one rotation. About 350 million years ago, it took 23 hours. Today, of course, it takes about 24 hours. And the days will gradually get longer still. Given that, you'd think 2017 would be the longest day in all of history. But while it's certainly up there, it doesn't quite take top honors. That's because tidal friction isn’t the only thing affecting Earth’s rotation — there are a few countervailing factors. The melting of glacial ice, which has been occurring since the end of the last ice age 12,000 years ago (and is now ramping up because of global warming), is actually speeding up Earth’s rotation very slightly, shortening the days by a few fractions of a millisecond. Likewise, geologic activity in the planet’s core, earthquakes, ocean currents, and seasonal wind changes can also speed up or slow down Earth’s rotation. Eventually, the effects of tidal friction should overcome all those other factors, and Earth’s days will get longer and longer as its rotation keeps slowing (forcing timekeepers to add leap seconds to the calendar periodically). Which means that in the future, there will be plenty of summer solstices that set new records as the "longest day in Earth's history." The image above was taken by NASA’s Solar Dynamics Observatory, a spacecraft launched in 2010 to better understand the sun. 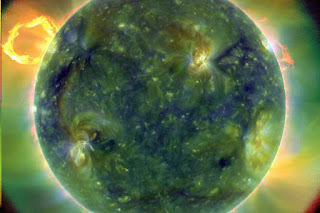 Caption: "A full-disk multiwavelength extreme ultraviolet image of the sun taken March 30, 2010. False colors trace different gas temperatures. Reds are relatively cool (about 60,000 Kelvin, or 107,540 F); blues and greens are hotter (greater than 1 million Kelvin, or 1,799,540 F)."